I’ve been going through this phase, of reading ‘classic’ novels, owing mostly to the Classics & 3D Bookshelf apps for iPhone (I don’t have to lug a book around on the train? Great!). I’m not sure what I expected, but I’ve been amazed at how enjoyable most of these reads have been, with such interesting characters and subject matter. For instance, who could have thought a book commentated by a 2-dimensional square about their 2-dimensional lives (and his adventures in a 1D and 3D world) could be interesting? But Flatland, a Romance in Many Dimensions (Edwin A. Abbot, 1884) delivers. One of my recent reads was Jules Verne’s 20,000 Leagues Under The Sea (first published in 1869). Simple enough concept; some guys travelling around the world’s oceans in a submarine, with the aid of scuba-diving equipment and pressure suits, all while studying the array of underwater mysteries and the enigmatic Captain Nemo (Nemo is Latin for “no one”). Yeah, that’s probably the worst summary in the history of summaries on a book that deserves more than my idiocy…there’s a much better summary of the novel here. The point of this ramble is; I had to remind myself several times during the read that practical submarines and SCUBA gear were elements of science fiction to many readers, when it was first published. Verne is referred to as an author that could, almost, see into the future. Sure, the concept of underwater travel was not originally borne of Verne (the first practical submarine, the Nautilus, was built for Napoleon in 1800, and was inspiration for Verne). Even the diving suits they used were inspired by Rouquayrol’s 1865 creation. Science inspired art. The interesting thing to note is that while Verne can’t be credited with creating submarines and diving suits, he is credited for his usage of them. He actualised a concept that reached out to inventive minds. He made it exciting, made it real, and inspired future developers. On the flip side of science inspiring art – we have art inspiring science in 20,000 Leagues, as well. There was a type of electrical-bullet that they used to hunt underwater; inspiring the Leyden ball. We hear it time and time again – there was no B until A wrote about it and inspired a scientific mind to actualise a concept. There was no Big Brother, until 1984 😛 and don’t even get me started about the connection between science and Star Trek. That gets me thinking; what do we see in more recently written sci-fi that could become real? What do we wish to be real? – advances in brain science, to enable mental deficiencies to be tweaked and fixed? How far can this go? Imprinting memories, or removing unpleasant ones (Dollhouse)? – tattoos that conduct digital signals (connecting us 24/7 to the Internet) (Commonwealth Saga by Peter Hamilton) and any other human genetic cross technological ‘upgrades’? There’s a movement Transhumanism, dealing with this idea of human+ (Cybermen? XD). – pre-birth genetic engineering to remove allergies, mental problems and potential ailments (Gattaca)? We’re already able to choose which gender our baby will be…how far will this type of pre-birth tweaking go? – a computer game that hooks into your mind directly and you create the story as you play (eXistenZ)? Want. – dare I say it – a way to remotely control another body (Avatar, Surrogates)? Or building on this, insurance policies that include clones, to be used for spare parts should anything happen to you (The Island)? – video-waiters (Back To The Future II)? Don’t we already place our orders at Subway via a computer kiosk in some places? Takes the hassle out of getting the human staff to figure out exactly what you want after all. Where will this lead? To the end of minimum wage service roles? On the topic of Back to the Future II – we can forgo the wall faxes and double ties, thanks. But where’s our hover cars / boards? Our self-tying laces? Our one-size-fits-all clothing that adjusts to fit you? Thumbprint identification replacing credit card signatures? Etc. There’s a couple of interesting articles on 11points.com, discussing 11 Predictions That Back to the Future Part II Got Right and Wrong. Definitely worth a read! 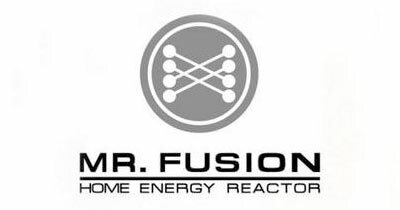 Or, overpopulation and depletion of the worlds resources, to the point where we cannot waste any viable sources of protein and our food source includes…weelll, let’s just not eat anything marked Soylent Green just yet, k (Make Room, Make Room by Harry Harrison)? Bleh. What gadgets or ideas have you read about in sci-fi novels, or watched and thought that given the right mind, that could be made real? I want a lighsabre (do I really have to credit it? ), to cook my toast while I slice bread (The Hitchhiker’s Guide to the Galaxy movie). 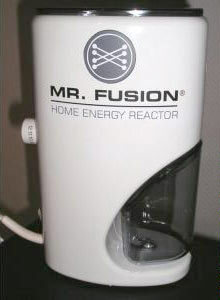 And throw in a Mr Fusion; turning trash into energy. A really interesting topic, Min – thanks for raising it! I’ll admit straightaway that I read more fantasy than sci-fi, so I’m not an expert on the latter genre. Lest I make any misleading generalisations in this comment, I beg forgiveness in advance from the resident sci-fi lovers. I do find sci-fi fascinating, and largely because of its penchant for predictions. Science fiction is so concerned with the implications of technology: what it means for us, our society, and our future. This makes it a great vehicle for questioning things that already show signs of happening (such as the neuroscience advances and self-aware systems you mentioned), exploring where those things might lead. And, of course, as you say here: it works both ways. Art explores science, but science is inspired by art. I have increasing trouble figuring out which came first in many situations.